As a designer, I am always exploring new techniques for creating my jewelry. Mind you, they are not new to the world, just new to me. Creating art is progressive, and jewerly is art. Women become canvases. When we add makeup, to look better, we are basically painting our face. We get dressed, and then add jewelry to add a little bling to our look. Sometimes we want casual jewelry, and sometimes we want to go for "wow". So jewelry is art, and artists evolve. I have wanted to add gold to my creations, but we all know that gold is very expensive. This is where an old Koren technique, called Keum-Boo is used fusing 24K gold foil to sterling silver with heat, is something I've starting doing. You will see that I have starting using diamonds to some choice pieces too. Nothing like diamonds to really add some bling. 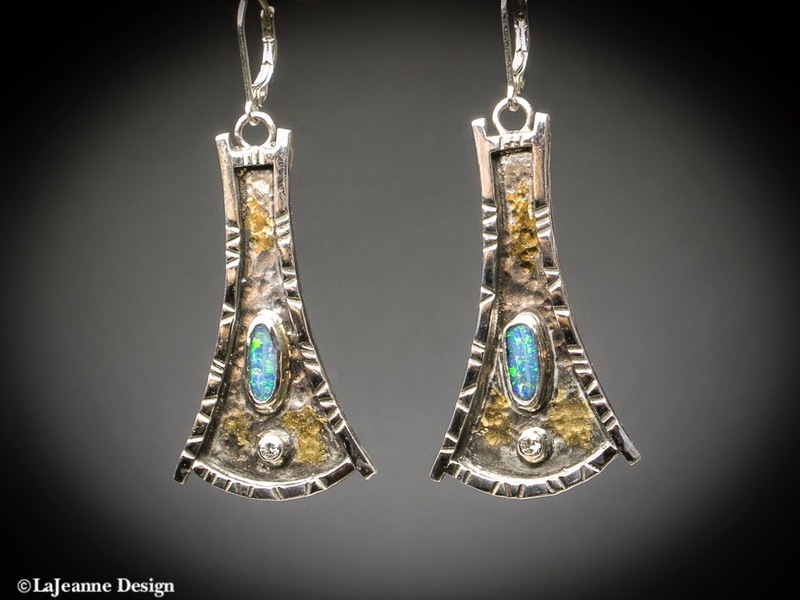 Here is a pair of sterling silver earrings, with Australian boulder opals, diamonds and Keum-Boo 24K gold.